The only Japanese dictionary worth paying for. An off-line english japanese dictionary which uses Jim Breen's JMDict (upgraded EDict)/KanjiDic2/WWWJDIC data along with data from the Tatoeba project. Does not require japanese keyboard. Internet access is used only to download the dictionary - the application itself works offline. WARNING: Does not work correctly on some Galaxy Tabs 3, namely, the 10.1 Tab 3: users of 7" and 8" Tab tablets have reported that Aedict works correctly for them. Please do not buy this app if you own the Galaxy Tab 3 10.1 device. - omnibar allows search by kana, romaji and/or english, german, french, Russian, Dutch, Portugalese, Spanish, Hungarian, Slovene, Swedish. Deinflects verbs automatically. 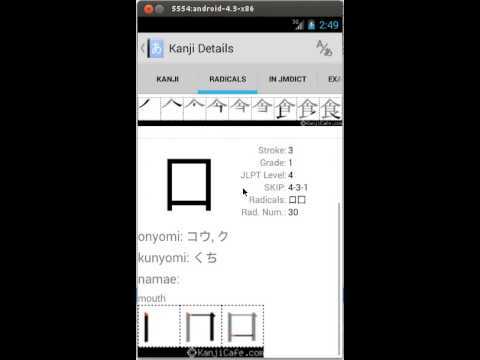 - powerful Japanese search: support for mixing kana and kanji (e.g. search for 見ため will also find 見た目), automatic vowel prolonging, e.g. しゅじん will also find しゅうじん. - optionally shows romaji instead of hiragana/katakana. - You can store entries in a notepad and practice the notepad contents with notepad quiz. UPDATE NOTE: When updating Aedict, please also update all dictionaries, to gain access to the new features. Aedict 3 needs to download the dictionaries which is cca 200mb download - please make sure that you are connected to the WIFI to avoid additional charges. Aedict 3 cannot use dictionaries used by Aedict 2. Aedict 3 is based on Aedict 2.9 but introduces new Android 4 GUI. Aedict 3 works on Android 2.1 and greater. I purchased the application years ago, but today I'm being told I must \npurchase a paid subscription in order to study customised notepad. This is \nnot fair. Hi Martin, this app is really wonderful. Makes my N1 study very easy because of huge vocabulary. I have 2 questions: 1. All the words still don't have example sentences, are you working on that? 2. Although I am backing up my notepads on a regular basis, what steps do I need to take to make sure I can use them on the new device, otherwise I'll be screwed. Will just normal copy paste work if I keep the backups of updated notepads copied on the PC. All I ever wanted from an electronic dictionary. Auch das deutsche Wörterbuch ist tadellos. わたしが大好きな携帯辞書！使いやすいし、例文もあるし、新しいバージョンも今frequent かrare と書いてあるのでどれの言葉がよく使うと分かる。全部正しくはないのに助かった。my favorite dictionary application! The text to speech function returns an error every time I try to use it (error (-1)). AnkiExport also does not work for me. Everything else is more or less okay. Export to Anki Perfect Export to Anki works again perfectly with manual modification! Thank you! Anki Export is useless now I bought AEdict for the Anki export feature, but new updates have made it useless. I used to be able to make a custom card with editor, but now 3 (3!) cards are autocreated with a format I can't control or change. I only care about Japanese-\u0026gt;English and want to add example sentences and notes. How to reenable the old method?? Nice app Everything is working fine and smooth on my ZenFone 2. Had issues with previous update, but all seems well again with the lastest update on 9/26/2015. Best app of its class in the market Well-thought out customizations, nice UI, useful functions. Overall a great user experience. 2 things on my wishlist are accenting (like the NHK dictionary) and similar kanji results.